Rotary Ball Spline | Products Lineup | Products | NIPPON BEARING CO., LTD. 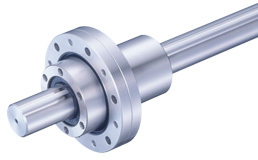 The NB ROTARY BALL SPLINE can be used for both rotational motion and linear motion. The applications include SCARA robots, the vertical shaft of assembly equipment, tool changers, and loaders, etc. The NB ROTARY BALL SPLINE nut consists of a spline nut and a rotating portion using cross rollers. Because of the single-body construction consisting of the rotating element and the spline element, the number of parts is reduced so that the accumulated errors are also reduced. The use of cross rollers and 4-row ball circuits structure provide high rigidity in spite of the compact design. The use of cross rollers keeps the housing thickness to a minimum, making the ball spline light and easy to install. The cross rollers ensure accurate positioning in the rotational direction.